Cupola furnaces are tall, cylindrical furnaces used to melt iron and ferrous alloys in foundry operations. Alternating layers of metal and ferrous alloys, coke, and limestone are fed into the furnace from the top. A schematic diagram of a cupola is shown in Figure. 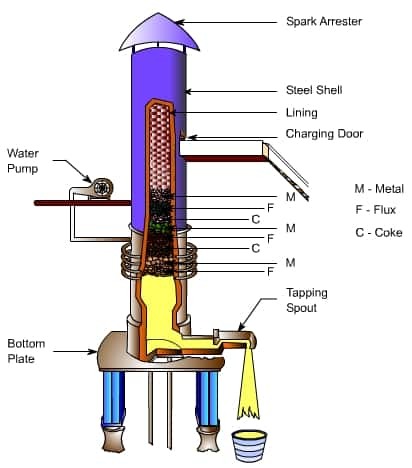 This diagram of a cupola illustrates the furnace’s cylindrical shaft lined with refractory and the alternating layers of coke and metal scrap. The molten metal flows out of a spout at the bottom of the cupola. At the top conical cap called the spark arrest is provided to prevent the spark emerging to outside. First the drop door at the bottom is closed. Sand bed with slope towards tap hole is rammed. Coke bed of suitable height is prepared above the sand bed and is ignited through the tap hole. After proper ignition, alternate layers of charge, flux and coke are fed through the charge door. Then the charge is allowed to soak in the heat and the air blast is turned on. Within 5 to 10 mins, the molten metal is collected through the tap hole. When enough metal is collected in the well of the cupola, the slag is drained off through the slag hole. Then the molten metal is collected in the ladles and is transported to the moulds with a minimum time loss. Fluxes are added in the charge to remove the oxides and other impurities present in the metal. The flux commonly used is lime stone (CaCO3) in a proportion of 2 to 4% of the metal charge. Others fluxes used are dolomite, sodium carbonate, calcium carbide. Flux reacts with oxides to form compounds having low melting point and lighter so that it will float on the metal pool. When charge comes through the coke bed, some amount of carbon is picked up by the metal depending on the temperature and the time when the metal is in contact with the coke. It is of the order of 0.15% carbon. It is Oxidised in the cupola and there will be a loss of 10% silicon. It may be as high as 30%. To increase the silicon content, ferrosilicon is added to the metal. There is a loss of 15 to 20% manganese during melting process. The content of manganese can be increased by the addition of ferromanganese. There will a sulphur pick up in a range of 0.03 to 0.05%.